So it only took 3 or 4 returns, but my new home theater is up and running. First, the mount was the wrong size, and the digital optical cable was too short. Then, and this one's the worst, the Sony BDP-570 Blu Ray player we got has a known technical issue involving Netflix. So that had to go back to Best Buy too. I picked up the LG 570 and am hoping it corrects the situation. Netflix had a buffering issue which made watching even TV shows impossible. No, it wasnt my internet connection. The Wii works just fine, but the quality coming out of the blu ray is so much better. I had to teach customer service at Best Buy how to do the exchange, but other than that, it all went off without a hitch. Here's to happy streaming! 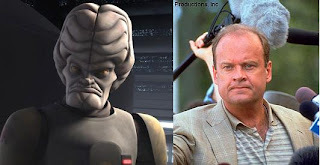 After watching Star Wars Clone Wars Season 3 "Clone Cadet" I knew I had seen Sgt Bric somewhere....like on Fraiser? Really KidRobot? This is the best you can do for a Golden Ticket Dunny? Its definitely no Coralie/Supakitch. What's next for the condiment series? Salt and Pepper? BBQ sauce? This set should've been packaged together in a neat little wire condiment carrier, put in a window box set with picnic-inspired checkboard graphics and sold for $60. Here is my custom R3-T7 Astromech USB. 1GB of flash memory. Dome glows bright red when in use. 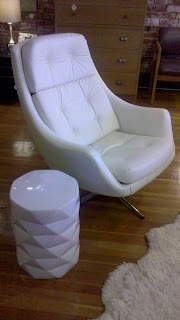 Here's my vintage R5-D4 (no bad motivator!) 4GB USB Flash drive. Fiber optics make his eyes glow a faint green.